These units were manufactured 1999-2000, installed at an Ultrapure Water system & used for approx. 18 mths. - 2002. Plant stripped out in 2005. They are in excellent condition. Measures flow in pipes 25mm (1in) to 5M (200in) Diameter. 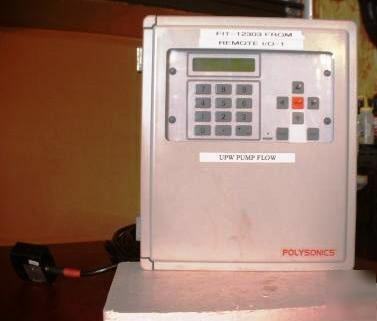 The Polysonics DCT6088 is an advanced transit time ultrasonic flowmeter which utilizes a unique digital correlation technique to measure the flow of clean liquids. The non-intrusive design can be applied to pipes of all sizes reducing installation cost and service downtime. This is very useful for high purity liquids, having nothing in contact with the liquid. Thanks for stopping by....Be sure to add me to your favorites list!